1. The enemy enters your house and buries an ‘evil object’ in the floor. 2. The object turns into a mouse, or an ant hill, and makes terrible noises, enough to drive the home owner mad! 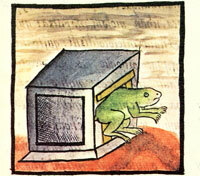 Frogs are put in the roof where they croak constantly. What signs of bad luck do you know? Is it walking under a ladder? Or seeing a black cat pass in front of you? Superstitions are part of all the world’s cultures. In England some people avoid stepping on cracks in the pavement or walking under ladders. What did the Aztecs interpret as harmful symbols of bad luck? The following article, written by Julia Flood, is based on the presence of frogs, mice and ants within the confines of the house. As you read on, you might see that these animals were not considered to be mere pests! The English text comes from The Florentine Codex, Book V, Chapter X, Fray Bernadino de Sahagún, translated by Anderson and Dibble, Utah University Press, 1950. *Nahua is a name given to the peoples of the Central Highlands. This includes tribes like the Aztecs and the Toltecs. A swarm of ants in the house: a terrible curse! Aztecs believed that their enemies planted a bad object in the floor of their house. This object would then turn into a nest of swarming ants that would set about killing the owner of the house. 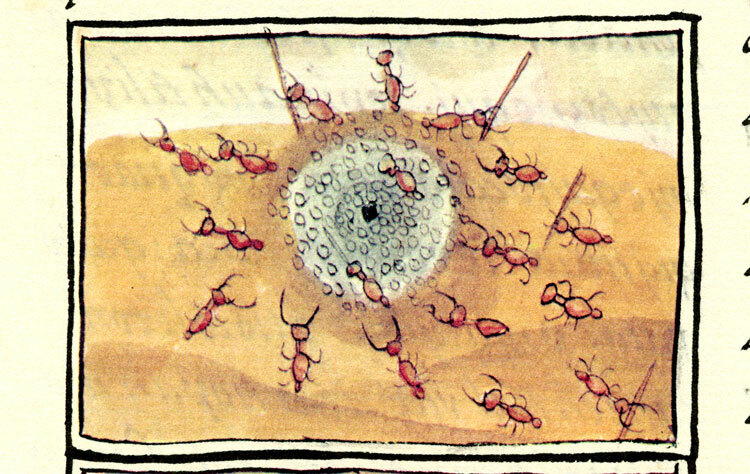 Whether any ‘persecutor’ was ever caught burying such evil into the floor of a home remains undocumented, but the Aztecs clearly thought that an indoor ant nest was a dark omen. The frog pictured here is standing in the doorway of a house. Its large figure gives an air of invading the home it occupies. Frogs, called ‘cuéyatl’ in the Aztec language of Náhuatl, are spoken of in Sahagún’s General History of the Things of New Spain as common amphibians, some of them eatable. 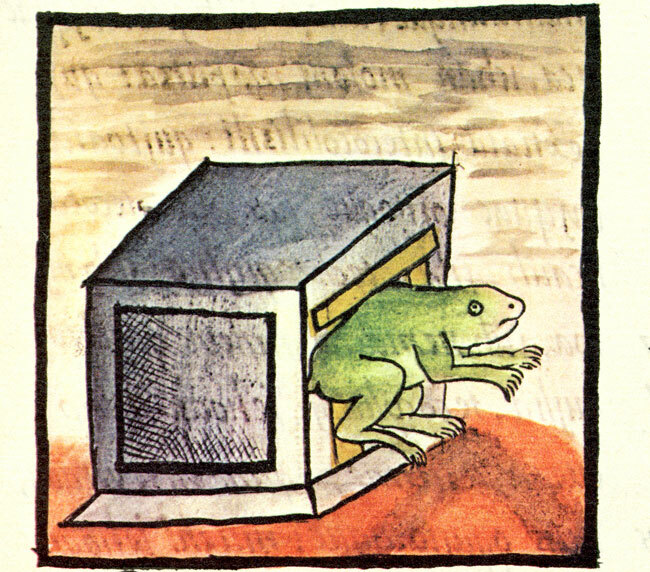 Just as we only recognize a black cat as the bearer of bad luck, the only frogs the Aztecs considered to be a threat were those that were ‘put’ inside the home. This was said, albeit sarcastically, to those who took too long to travel from one place to another. If you could hear perpetual squeaking in your home, it was likely that your enemy had buried an “ominous mouse” under the floor! Whenever this person spoke, the charmed mouse would squeak. Enough to drive you ‘round the bend! 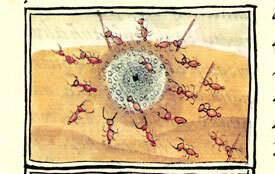 Elsewhere in the Florentine Codex, there is a chapter dedicated to the ‘gnawing of mice’. In it, we are told that he who eats from the same piece of food that a mouse has gnawed at will find himself falsely accused of a crime. Why? Because, in him, people will recognise the traits of the mouse that stealthily comes to steal the food inside one’s home. A person so accused would usually be charged with telling a false story or the disappearance of an object.